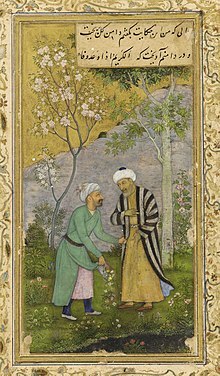 Abū-Muhammad Muslih al-Dīn bin Abdallāh Shīrāzī (Persie: ابومحمد مصلح‌الدین بن عبدالله شیرازی‎), better kent bi his pen-name Saadi (سعدی Saʿdī( Saadi (help·info))), an aa kent as Saadi of Shiraz (سعدی شیرازی Saadi Shirazi), wis ane o the major Perse poets an leeterar men o the medieval period. He isna anly famous in Persie-speakin kintras, but haes been quotit in wastren soorces as well. He is recognised for the quality o his writins an for the depth o his social an moral thochts. Saadi is widely recognised as ane o the greatest poets o the clessical leeterar tradeetion, earnin him the nickname "Master o Speech" or "The Master" amang Persie scholars. This page wis last eeditit on 26 Mairch 2017, at 00:30.